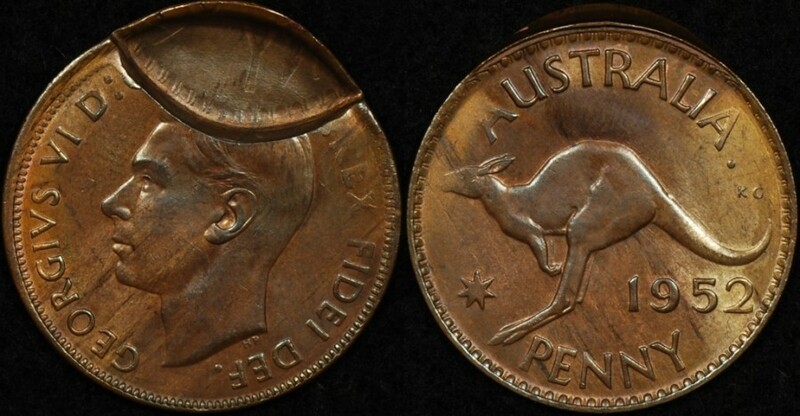 This 1952a Australian penny was struck in Perth but there was a press malfunction during it’s minting. The coin struck prior to this coin had not exited the press completely before the new blank fell into place and was struck.This resulted in an Indent error in the new coin in the shape of the coin that had not exited the press fully. You can see by the shape and size of the indent that the new penny was only just caught up in the minting of the second coin. We can tell the coin that didn’t escape quickly enough was a struck penny as you can see a partial brockage imprint of it (more clearly) in the close-up below. You can see incuse denticles and the NY of penny in the indent space – this is the partial brockage. Sometimes you can get indent errors that have been indented with unstruck or blank coins and the indent space shows no design. If this were a manufactured “in the back shed” error or post mint damage then you would see obliteration on the reverse of the penny behind where the indent occured which is not the case in this genuine mint error coin. It’s a lovely choice uncirculated example. We’ve spoken before about indent errors and they can have many forms. This is probably the more common (but still rare), more so that the one in our first entry Australian Indent Errors that was a $1 indented with a blank 5c (a whole different denomination) when 2 blanks had been fed into the press simultaneously, which is very rare.